Hey, y'all. Late April and early May have been pretty incredible in Orange County. Not on par with last year, when the wet winter created the most fluorescent spring I've seen in 30 years, but still: It's greened up okay. 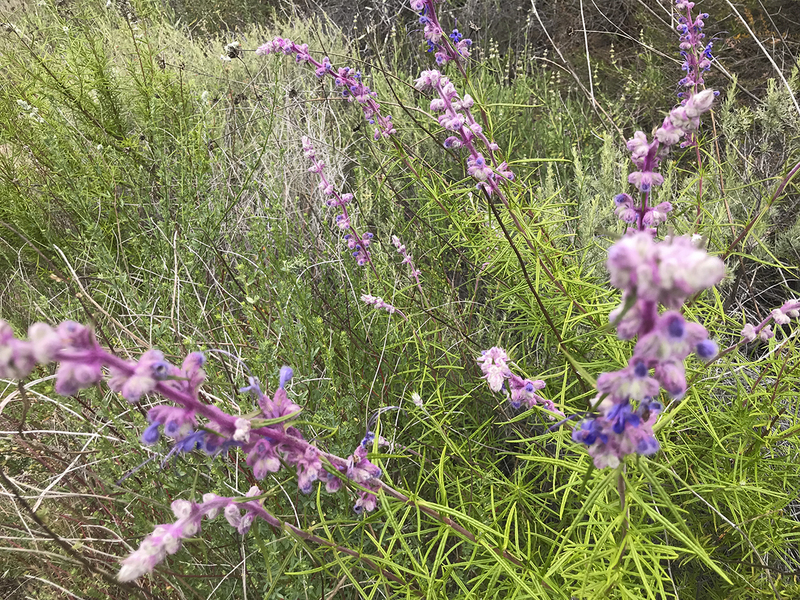 The lupine, Indian paintbrush, and a whole bunch of flowers I don't know are blooming. So are prickly pear and toyon. It's taken me a long time to love the chaparral. From a distance, it isn't much to look at. Up close, it's prickly and scratchy. My legs are crosshatched from minor scratches and scrapes that got sun on them and lost some of their melanin—riding explorer style on little used trails means paying minor prices. But man, it's a cool landscape, rugged and unrelenting, with smells that alight from each passing rider and hang in the air with sweet, acrid perfume. The Santa Anas aren't big by Rockies standards or even San Gabriels standards, but for the backyard they're plenty enough. 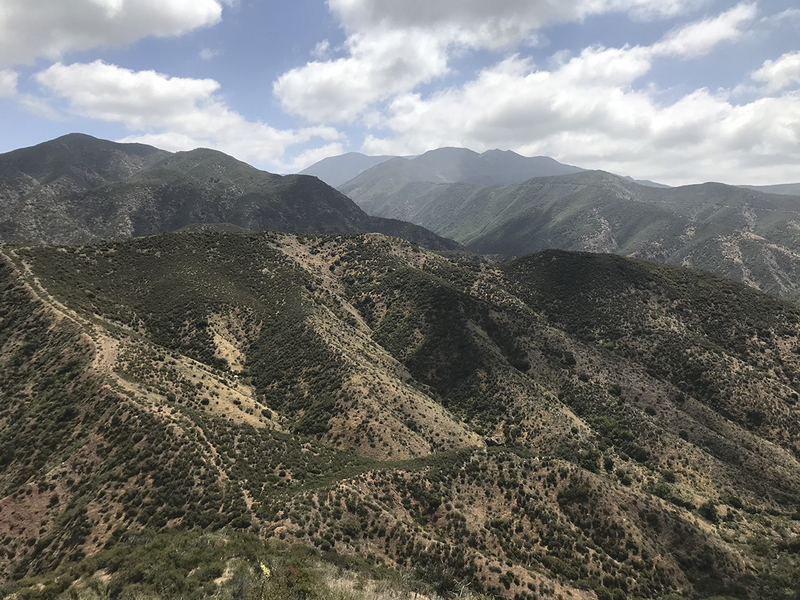 The spine is traversed by a fire road called Main Divide, and from most trailheads it's a minimum of 2,000 feet of climbing—and you can easily get 5,000. Last Saturday, I logged 4,300 vert and didn't even come close to the taller summits. Last weekend...oof. My ride started off cool and pleasant, so cool that I briefly considered packing a layer in case the elevation difference meant a temperature difference. Once the sun got on me, it was the opposite. It turned hot and by the time I got to Main Divide via Black Star Canyon, about 75 minutes and 2,000 vert, I was feeling it. Turns out, I had some kind of virus coming on and spent the next few days laying low with a sore throat, but on Saturday I was mostly feeling old, slow, and tired. And the thing that I love about the Santa Anas is that there aren't many bailouts. The spine is such a roller coaster, retreat often means as much climbing as pushing on. There's no water (I nursed two bottles, but could have used two more) and little shade. Once on Main Divide, you might see another one or two riders, or none. You're looking down on suburbia, but a broken frame, injury, or serious heat issues can mean real problems. 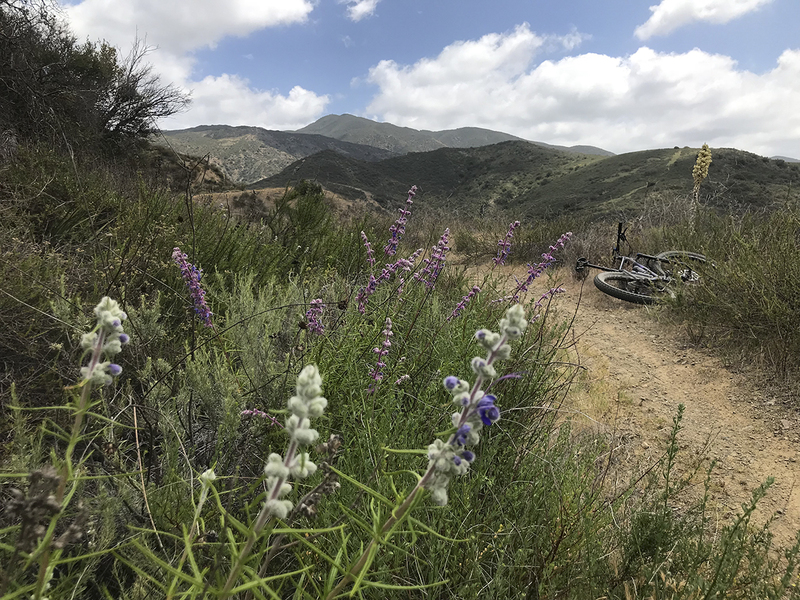 Which I think is cool: Southern California doesn't get much respect from outsiders as an adventure spot, but this terrain is legit enough to treat it with respect. Anyway, Saturday. I limped my way along Main Divide heading south and didn't see another rider. I kept eating and nursed my water bottles. Right near my drop-in, a ridiculously fun singletrack plummet called Motorway, I ran into a wildland fire crew who offered water. I probably should have accepted some because an unfixable mechanical on the descent—or worse something like a broken collarbone—would have been Not Good. But, well, pride. I bombed Motorway, set a PR despite feeling crappy, and rode gravity another seven miles to a market with blissfully cold drinks. Even with tail between my legs and feeling tattered, it was pretty sweet.